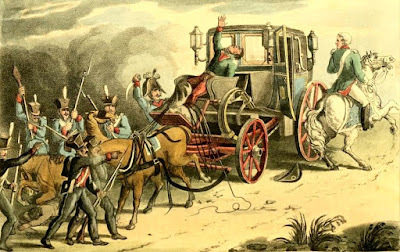 What happened to Napoleon's carriage? It is not clear whether the carriage was sold to the British government by the Prussians or sent as a present to the Prince Regent. 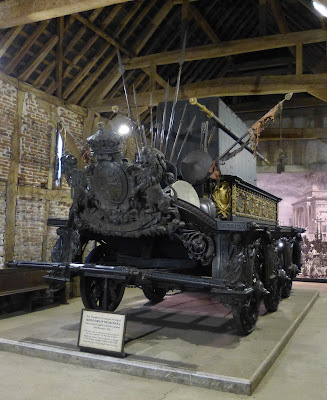 Either way, the carriage came to England and was sold (or lent) to Mr Bullock. 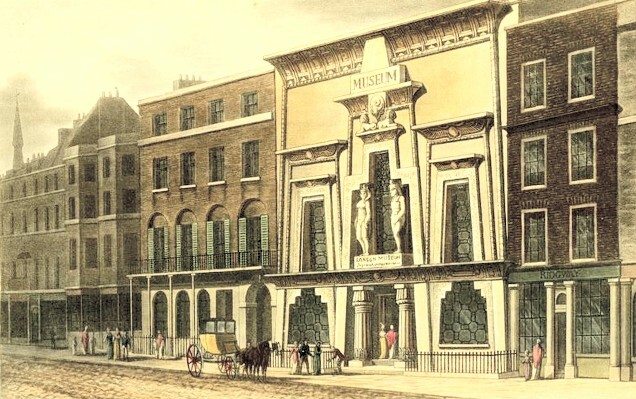 It went on display at his London Museum, at the Egyptian Hall, Piccadilly, and then, at the Prince Regent’s desire, went on tour throughout England, Scotland and Ireland. The carriage excited a good deal of interest and it was estimated that Mr Bullock made in excess of £26,000 from the exhibition! 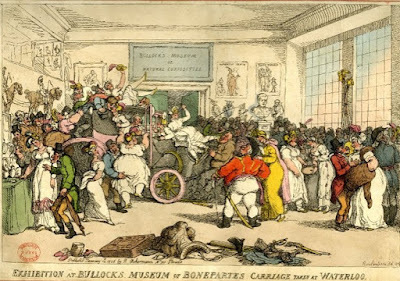 The popularity of the exhibition at Bullock’s Museum was caricatured in Rowlandson’s print, shown below. What was the carriage like? It claimed that “the pannels of the carriage are bullet-proof” and stated that “the under-carriage and wheels are painted in vermillion, edged with the colour of the body, and heightened with gold”. “Among the gold articles are a tea-pot, coffee-pot, sugar-bason, cream-ewer, coffee-cup and saucer, slop-bason, candle-sticks, wash-hand-bason, plates for breakfast, &c. Each article is superbly embossed with the Imperial arms, and engraved with his favourite N.; and by the aid of the lamp, any thing could be heated in the carriage. Other items in the carriage included “a small mahogany case” containing “the peculiar necessaire of the ex-emperor” - “nearly one hundred articles, almost all of them solid gold”; a liquor-case; and a writing desk. 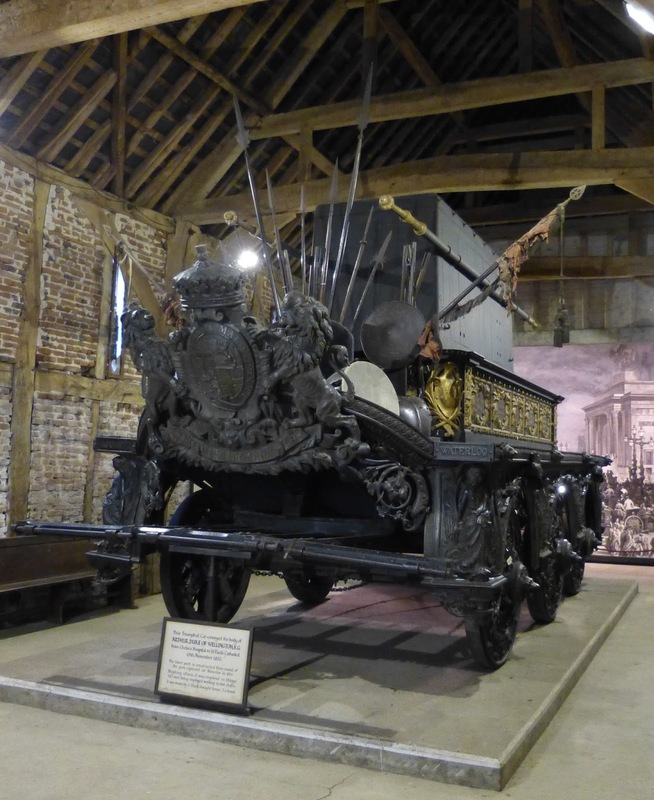 After the tour, the carriage and its contents were sold by auction and bought by someone who wanted to exhibit them in America. Unable to realise his intentions, it was sold again and then taken by a coach maker as part payment of a bad debt! 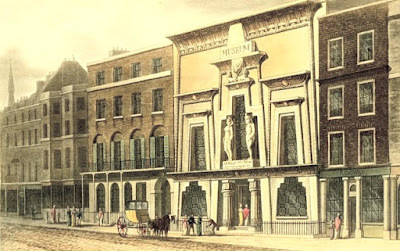 In 1842, this company sold it to Madame Tussaud and Sons where it formed part of a special exhibition about Napoleon. And so Napoleon’s carriage met a sad end, consumed by flames, 110 years after the Battle of Waterloo at which it was captured. 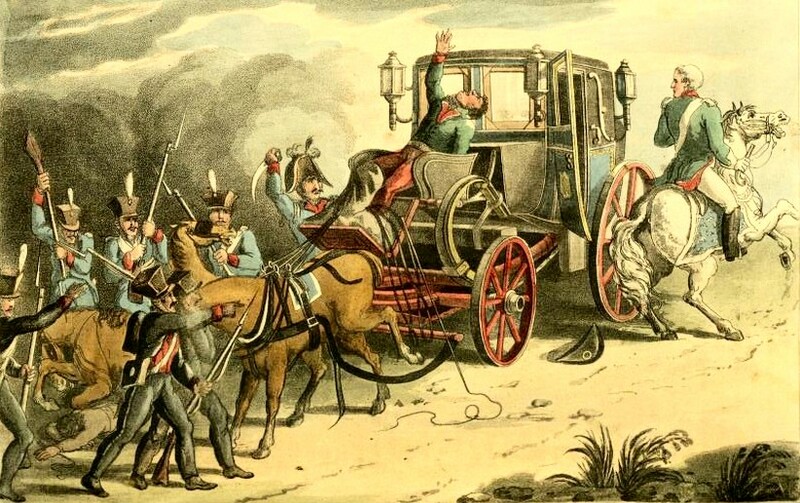 Fortunately, some of the items captured from Napoleon’s baggage train did survive and a number of them are on display at Windsor Castle in the Waterloo at Windsor 1815-2015 exhibition which runs until 13 January 2016. (1) From Ackermann’s Repository (Feb 1816). (2) From Literary Panorama (Dec 1815) as quoted in The Military Carriage printed for Madame Tussaud and Sons (1843). (3) From the Monthly Magazine (July 1816) as quoted in The Military Carriage printed for Madame Tussaud and Sons (1843). (4) From The Times Digital Archive for 8 Apr 1843 accessed 6 Feb 2015 © Times Newspapers Ltd – transcribed by me. (5) From The Times Digital Archive for 20 Mar 1925 accessed 6 Feb 2015 © Times Newspapers Ltd – transcribed by me. A shorter version of this article first appeared in my newsletter in February 2015. 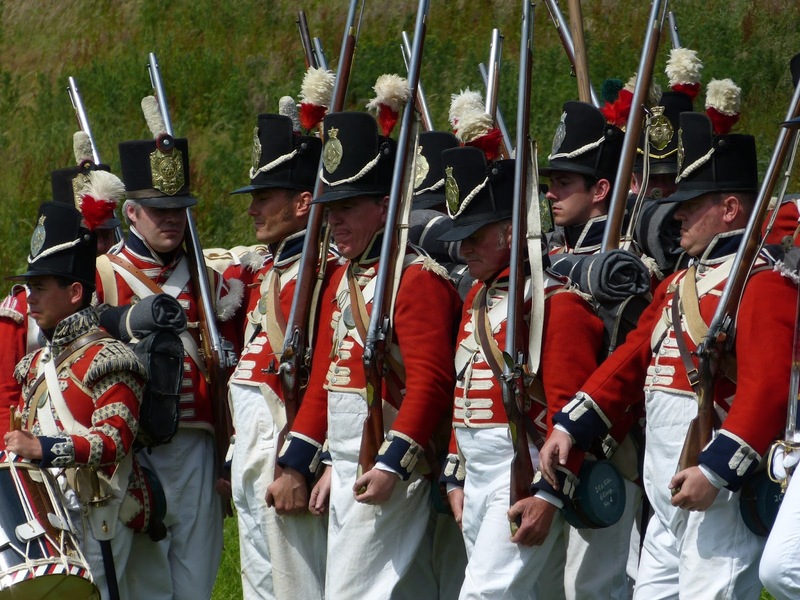 “We have had a great day, and have been successful,” (2) wrote Major Augustus Frazer, commander of the Horse Artillery in Wellington’s army, at 9pm on 21 June 1813. The dust would still have been settling after a day of ferocious military action. Frazer wrote a letter almost every day during his time in Wellington’s army, providing us with dramatic insights into military life during the Peninsula War. On this occasion he penned his correspondence from a site freshly contested, and no doubt still surrounded by the sights, sounds and smells that immediately followed a battle. While good communication was essential to an army's performance on the battlefield, even senior officers in the early nineteenth century struggled to keep up with what was happening beyond their immediate surroundings. In this letter from Vitoria, Frazer offers little description of the battle itself, but plenty of glimpses into the detail of the aftermath. Those who came through the battle unscathed had the task of dealing with their less fortunate companions. The following day Frazer oversaw the burial of “poor George Thelusson”, taking from his body his watch, ring and locket, which he implied would be passed on to the family. Differences between combatants were laid aside in the aftermath of battle. “I had an opportunity of solacing the agonies, and probably the last moments, of the French general of division, Sarrut, whom I helped out of the road, and laid against a bank, under charge of Bombardier Smith." 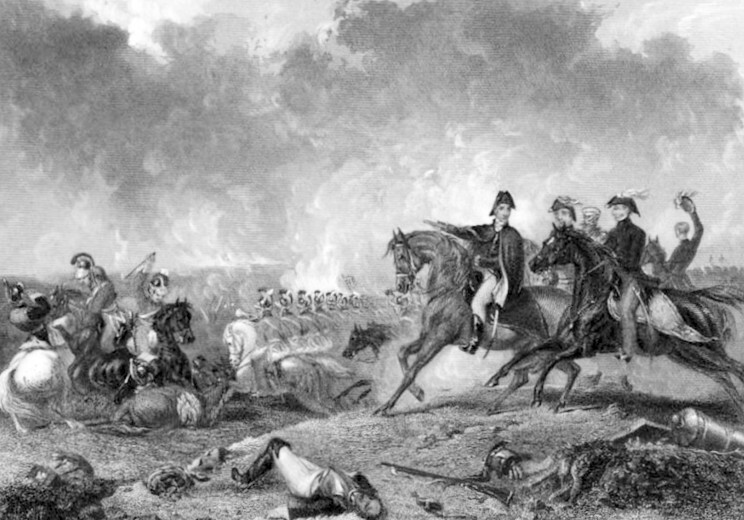 More than 5,000 troops under Wellington’s command were casualties in the battle, compared to 8,000 for the French. Frazer was right that the French had lost most of their artillery. In total over 150 guns were captured by the British, comprising most of the French arsenal. (1) The modern spelling is Vitoria but it was sometimes spelt with two 't's in the 19th century. (2) All quotes from The Letters of Colonel Sir Augustus Simon Frazer. For two days, Friday 16 and Saturday 17 June 1815, the population of Brussels, including many visitors from England, had endured painful uncertainty. They could hear the sounds of cannon to the south and knew that Wellington's army was engaging the French under Napoleon. But it was far from clear who had the upper hand. What these thousands of civilians feared most was that victorious French troops would enter, and ransack, the city. An anonymous observer of events in the city later published an account of their experience, offering us a vivid insight into what it was like for civilians during the Battle of Waterloo. Panic swept through the baggage train at the rear of the British army, and a torrent of frightened people fled into Brussels, leaving a trail of “broken and overturned waggons – heaps of abandoned baggage – dead horses, and terrified people”. Despite all the questions, there were no answers. 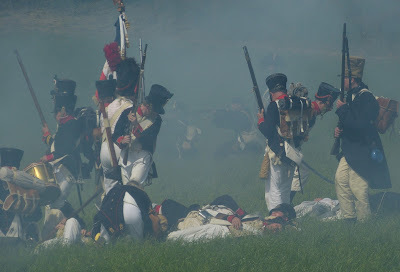 The dreadful overture of battle, the distant rumble of cannon fire, again played in the background throughout the day. Their nerves shredded by three days of suspense, “constant agitation and fluctuating hopes”, the population who chose to stay, or could not flee, had no choice but to wait. 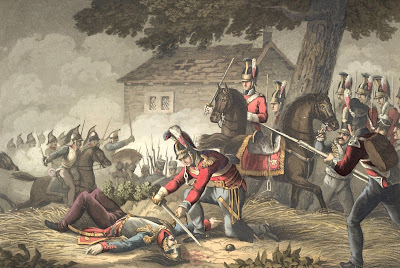 Just a few miles away, one of the most celebrated battles in European history was being fought in the fields, woods and hedgerows of Waterloo. 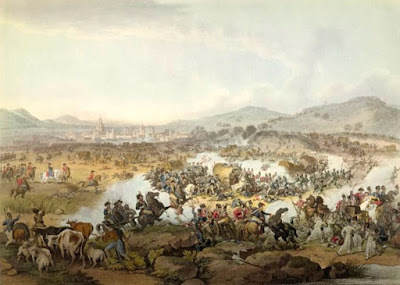 Finally, at around 9pm, “some wounded officers arrived on horseback from the field, bringing the dreadful news, that the battle was lost!” This prompted a fresh exodus away from the city, and the sense of foreboding deepened as carriages filled with wounded rolled into the city. Finally, at around 3am on Monday 19 June 1815, an official message arrived from Waterloo, “containing a brief account of the victory. 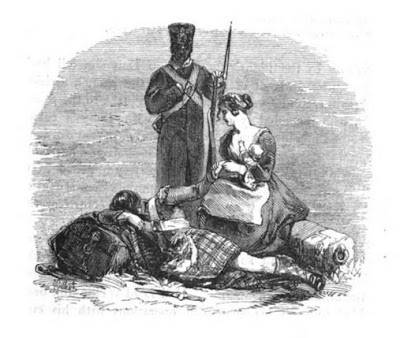 A party of wounded Highlanders, who had found their way on foot from the field of battle, no sooner heard the news, than, regardless of their sufferings, they began to shout and huzza with the most vociferous demonstrations of joy”. The mixture of relief and disgust engendered by a trip to the battlefield so soon after the conflict is hard to imagine. 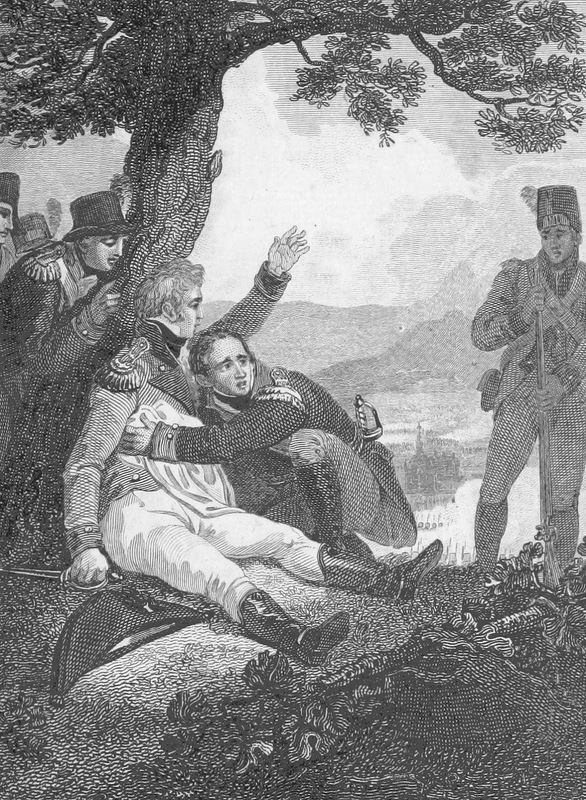 Following two days of smaller military engagements, Napoleon and Wellington faced one another on the battlefield for the first and only time. 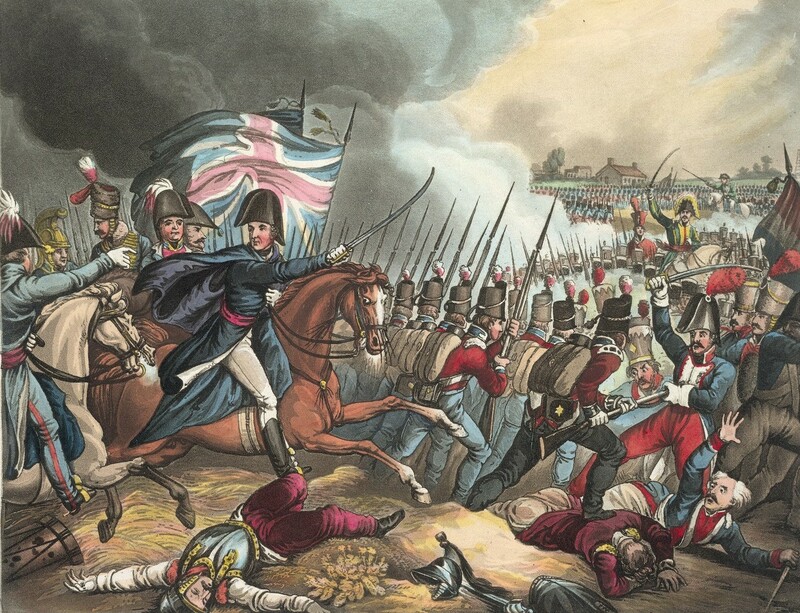 The Battle of Waterloo began at around midday and continued into the long June evening, both sides bitterly contesting the battlefield in a bid to break the other. Many of those present later recorded that it was the most ferocious battle they had ever experienced. In early evening the Prussian army under Blucher, defeated by the French two days earlier, arrived to support the struggling Allied army led by Wellington. Napoleon made a final assault with his Imperial Guard, undefeated in all their previous engagements. They were broken and their defeat signalled the end to the French, who fled the battlefield. While not the last battle between the French and the Allies, Waterloo was effectively the end of Napoleon's campaign. He raced back to Paris, but discovered he had little support and on 15 July, at Rochefort on the French coast, he gave himself up to a British warship. He hoped to be allowed to travel to America, or make a quiet home in England, but was instead exiled to the distant island of St Helena. (1) All quotes from The Battle of Waterloo by a near observer (1815). On Friday 16 June 1815, the city of Brussels listened in fear and awe to the sound of distant cannon fire. The British and their allies had marched from the city in the early hours to face the advancing French under Napoleon. All day rumours and reports from the nearby battlefields reached the increasingly nervous inhabitants, who feared that a French victory would see their city sacked by the French. Few went to bed easily that Friday night. 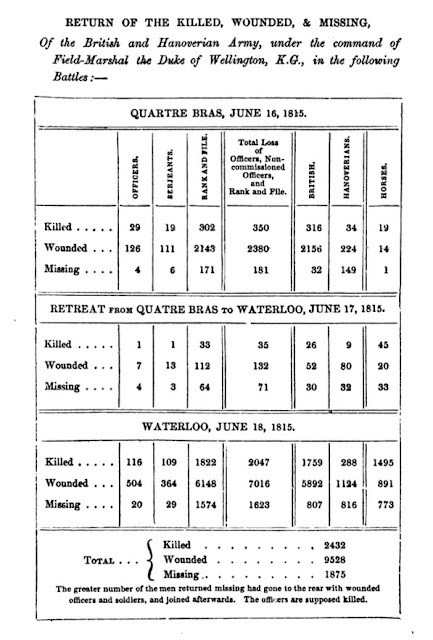 An anonymous observer of events in the city later published an account of their experiences, offering us a vivid insight into what is was like for a civilian during the three days of the Waterloo campaign. The alarm subsided, for now, when they realised the wagons were artillery heading towards, not away, from the battlefields to the south of the city. But fresh panic swept in at 6am when Belgian cavalry galloped through the streets “at full speed, as if the enemy were at their heels”. Yet again, this disorder was followed by news, from an aide-de-camp of the Duke of Wellington, that the British army was in good order and more fighting was to be expected. 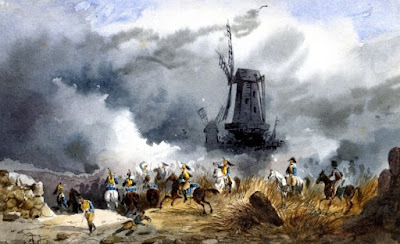 These terrible sights were accompanied by accurate reports that Wellington had retreated towards Brussels, as part of a tactical game of cat and mouse with the enemy. But “nobody could convince the Belgians that a retreat and a flight were not one and the same thing; and firmly convinced that the English had been defeated, they fully expected every moment to see them enter Brussels in the utmost confusion, with the French after them”. The sense of panic intensified on what must have been a sultry afternoon. “Every hour only served to add to the dismay.” The fearful were offering huge sums of money for a horse on which to escape the city, and many left on foot or in canal boats. The weather broke later that day, with a “violent thunderstorm”. As night fell, the frightened city and the armies in the field were lashed by “torrents of rain”. After the battles of Friday, the French and British armies spent Saturday positioning themselves for another fight the following day. The heavy rain that soaked the ground at Waterloo, making movement difficult, is considered to be one of the factors turning the final battle in favour of the British. 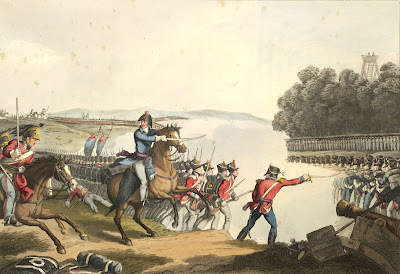 Read about the Battle of Waterloo in the final post of the series. According to many who where there, the Battle of Waterloo was the most ferocious engagement of its time. But what was it like for the thousands of civilians living in the nearby city of Brussels? Within earshot of the engagement, they knew that the outcome of the battle would have an immediate impact on their own lives. Should the French win, they would ransack the city. 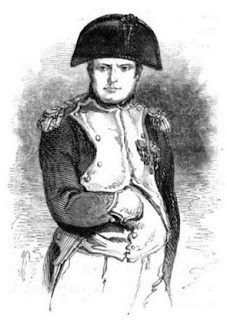 So wrote a ‘near observer’, author of one of the many published accounts of the greatest and final battle in the Napoleonic wars. The writer opens their work with a firsthand experience of life just a few miles from the epic engagement, portraying a city in a febrile condition, undergoing convulsions of panic as, for three days, the sounds, sights and smells of war filled the streets of a town hoping desperately to remain free from the ravages of a French occupation. On this long, early summer evening, Brussels saw probably the most famous of all Regency social gatherings – the Duchess of Richmond’s ball. The Duke of Wellington and almost all his officers attended, as did many of their wives and daughters, who were travelling with them. The glittering occasion was a stark contrast to the grim reality of war that would follow. There was “dismay and consternation” on every face, as news spread that the army would march out in the morning. Many young officers took their final leave of loved ones that night, never to return. In the early hours, the city was roused “when suddenly the drums beat to arms, and the trumpet’s loud call was heard from every part of the city”. Very quickly the “whole town was one universal scene of bustle”. 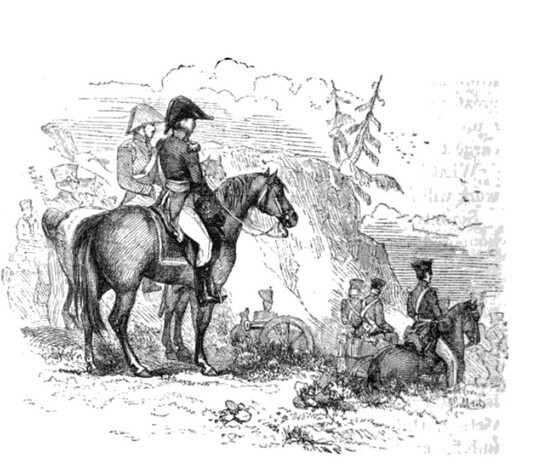 Wellington had ordered his army out to meet the swift advance of Napoleon. The troops gathered in Place Royale, “with their knapsacks on their backs, some taking leave of wives and children; others sitting down unconsciously concerned upon the sharp pavement, waiting for their comrades”. It being mid-June, dawn came early, bringing with it a procession of carts coming in from the country for the market. Old Flemish women came into town with poles of cabbages, green peas and potatoes and gazed in surprise at the bright array of soldiers assembling around them. 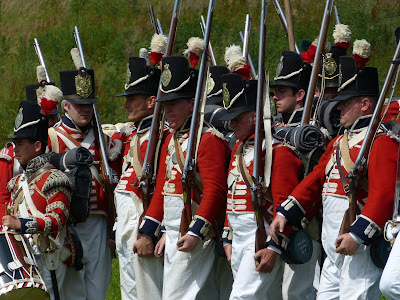 By 4am the regiments were formed up and began marching south out of the city. Many had little experience of battle, the core of the army who had fought in the recent wars having been sent to fight in other conflicts. Just four hours later, at 8am, the streets of Brussels were empty and the Place Royale deserted. A convoy of wagons had been assembled, in preparation to move the wounded, but its Flemish drivers dozed as they waited to be called to action. After a restless night, the people of Brussels waited anxiously to discover their fate. The day wore on without much expectation of news, when at around 3pm the sound of nearby cannon fire rocked the city. 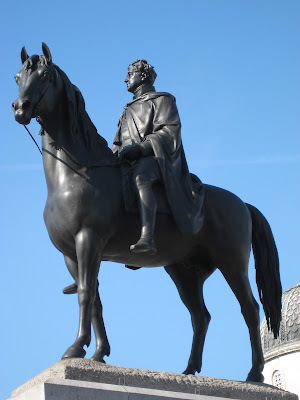 It came from the south, from the direction of Waterloo, which was just 13 miles from the heart of Brussels. 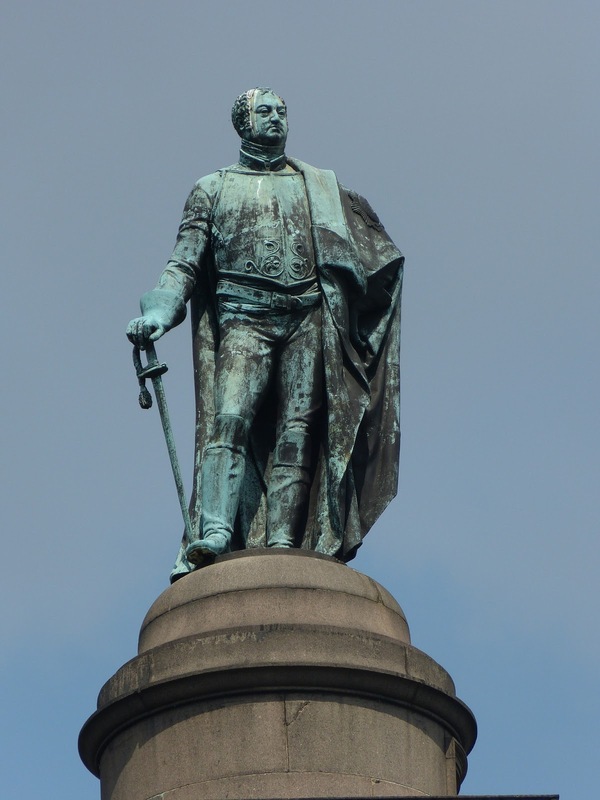 What the residents of Brussels overheard that Friday were the twin battles of Quatre Bras and, more distantly, Ligny. 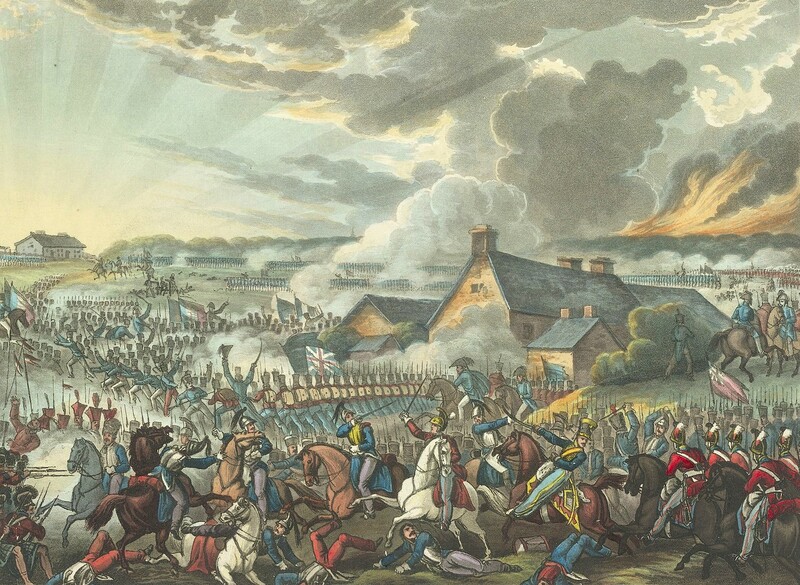 At Quatre Bras, the French army led by Marshal Ney, was beaten back by Wellington as they tried to secure a strategic crossroads. 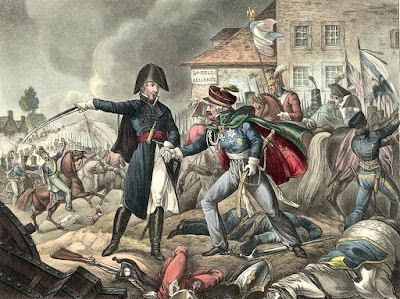 Napoleon, leading another French army, was more successful at Ligny, where the Prussians under Field Marshal Blucher were defeated. 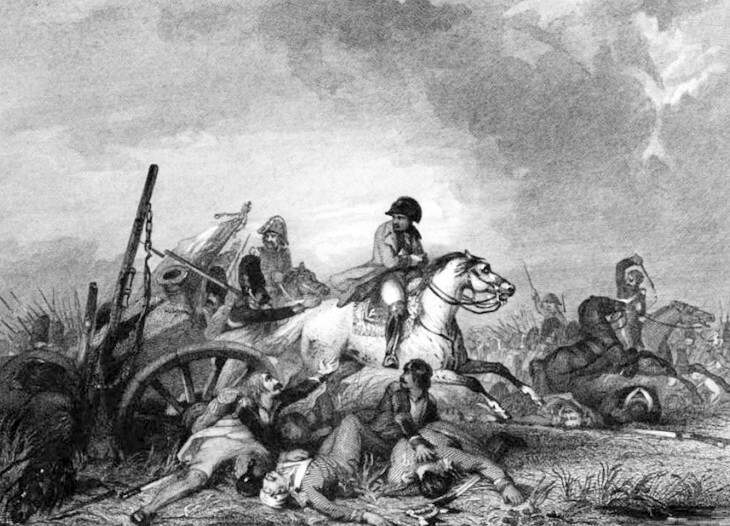 With the Prussians beaten back, Napoleon prepared to defeat Wellington and march victoriously into Brussels. 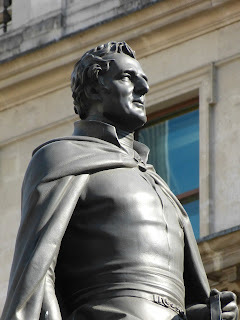 Arthur Wellesley, 1st Duke of Wellington (1 May 1769 – 14 September 1852), was the British military commander famous for defeating Napoleon at the Battle of Waterloo. 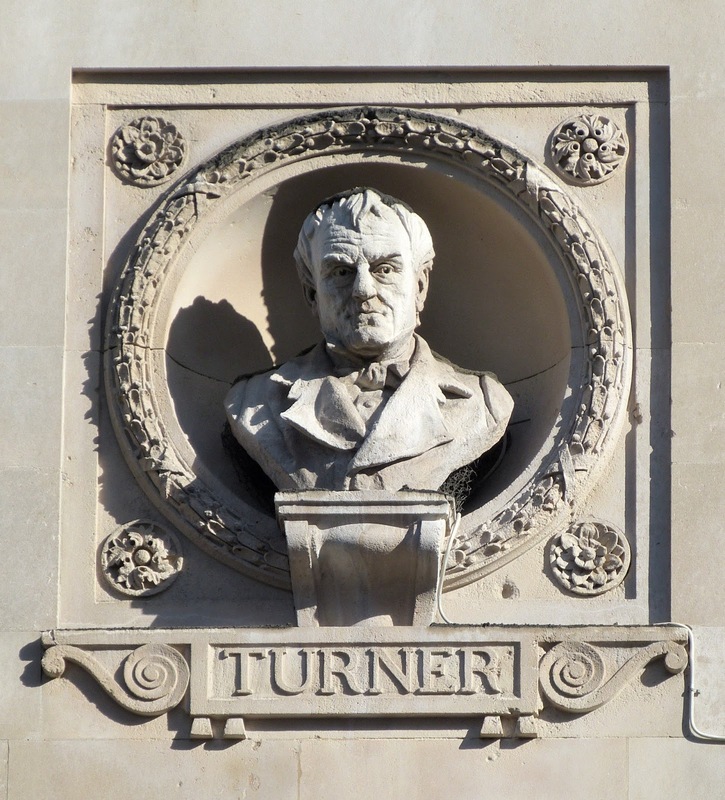 He was also a Tory politician and British Prime Minister from 1828-30 and in 1834. Arthur Wellesley was born in Dublin on 1 May 1769 (1), the third surviving son of Garret Wesley, 1st Earl of Mornington, and his wife Anne Hill, daughter of the 1st Viscount Dungannon. 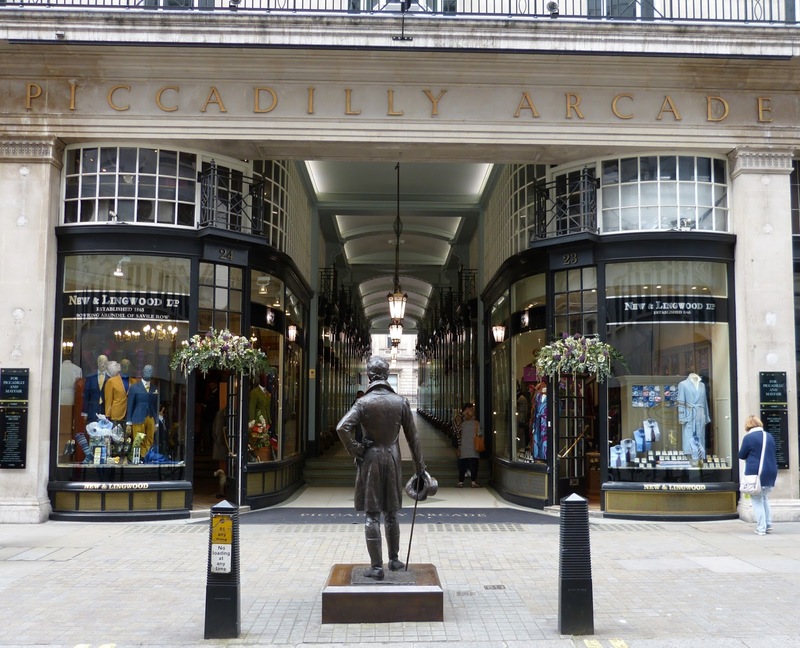 His elder brother Richard adopted the variation Wellesley as his surname in 1789 and Wellington followed suit by 1798. 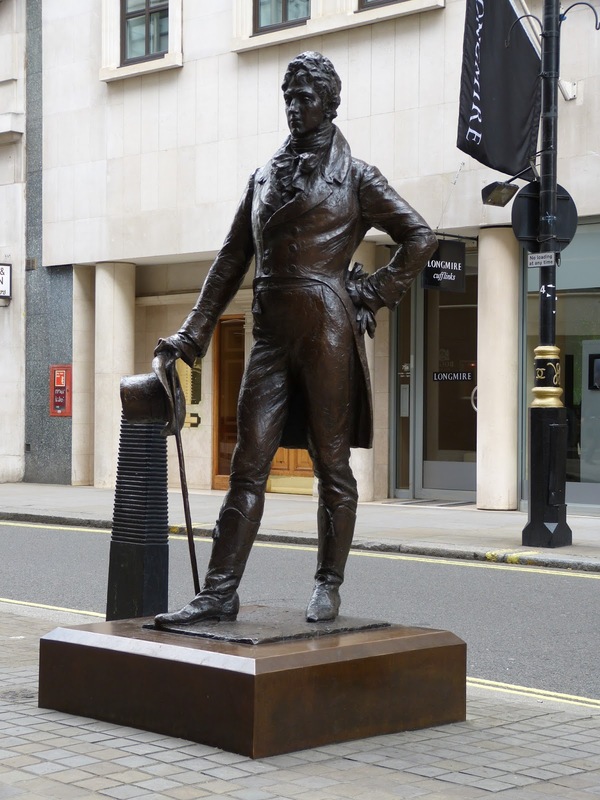 Wellington’s father died when he was 12 and his domineering mother thought him inferior to his elder brothers. He played the violin and was good at arithmetic, but made little academic progress during his time at Eton College (1781-4). 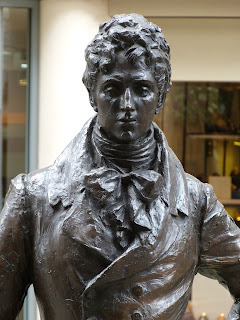 In 1785, he went to Brussels with his mother and learnt French from their landlord. His mother decided that all he was fit for was the army and accordingly sent him to the Academy of Equitation at Angers in France to prepare him for his future career. 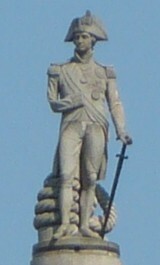 Through his eldest brother’s influence, Wellington gained his first commission in the army as an ensign in March 1787. After a series of promotions, he sailed to India as a brevet-colonel in the 33rd Foot in June 1796, where he was soon joined by his eldest brother Richard who had been appointed Governor General and his younger brother Henry who was his secretary. 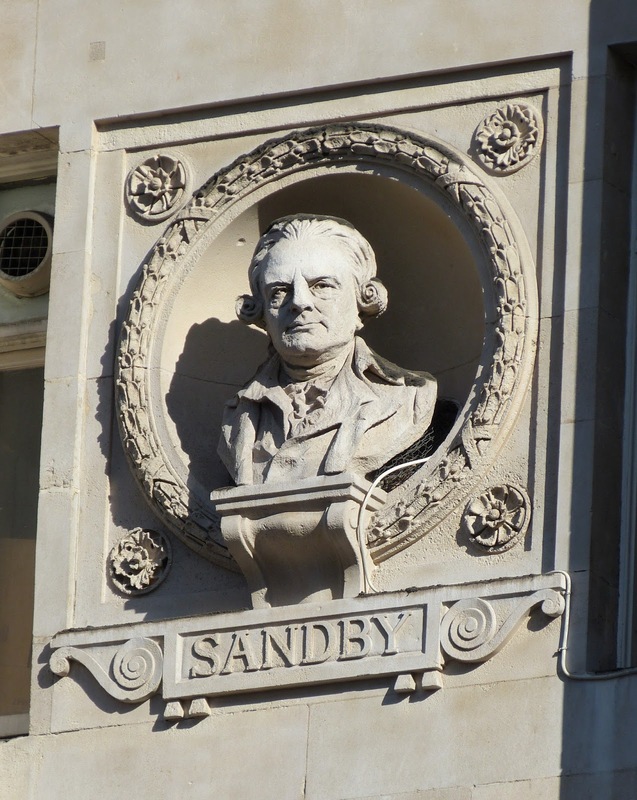 He returned to England in 1805 having been made a Knight of the Bath for his service in India and with a personal fortune of £42,000 amassed through his campaigns. In January 1806, he became Colonel of the 33rd Foot on the death of Lord Cornwallis. 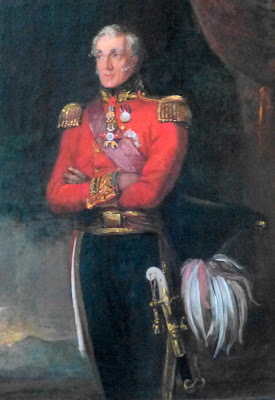 Wellington served in the Peninsular War (1807-1814) against France under Napoleon and won significant engagements including those at Ciudad Rodrigo, Salamanca and Vitoria, after which he was promoted to the rank of field marshal. Vastly outnumbered by the French forces, he gained a reputation as a master of defence. He ensured that the civilian population was treated well which led to good information about the movements of the French forces—a critical part of his military strategy. After Napoleon’s abdication, Wellington was appointed British ambassador in Paris, and served at the Congress of Vienna. 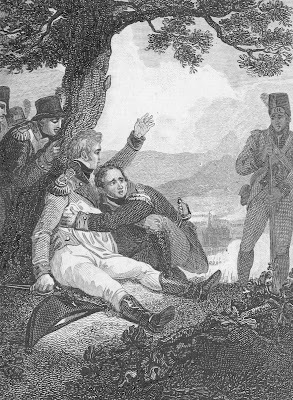 When Napoleon escaped from his exile on Elba in February 1815, Wellington led the allied forces against him, culminating in his most famous victory at the Battle of Waterloo on 18 June 1815. Wellington was a sociable man, a prolific letter writer and a great conversationalist. Whilst serving in the army, he would often get up at six and write letters for three hours before breakfast. He would spend time with his staff officers in the morning and visit his troops or other places as necessary in the afternoon. He was surrounded by a loyal band of young gentlemen—his aides-de-camp—mostly from aristocratic families. He encouraged his officers to arrange balls and concerts and enjoyed their conversation over dinner though he had little interest in food. During the winter he hunted with his own pack. 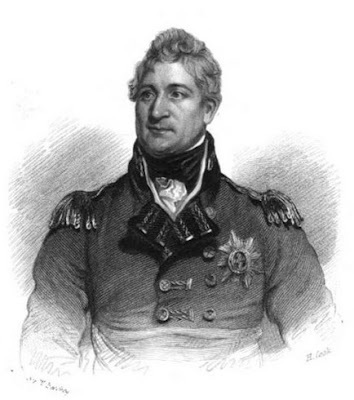 With successive victories, Wellington was awarded more and more honours. 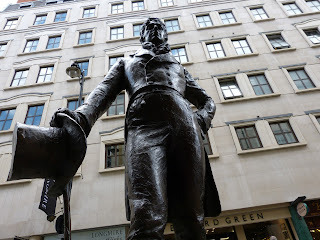 He was made Baron Douro and Viscount Wellington of Talavera (4 September 1809), Earl of Wellington (28 February 1812), Marquess of Wellington (18 August 1812) and finally Marquess Douro and Duke of Wellington (3 May 1814). 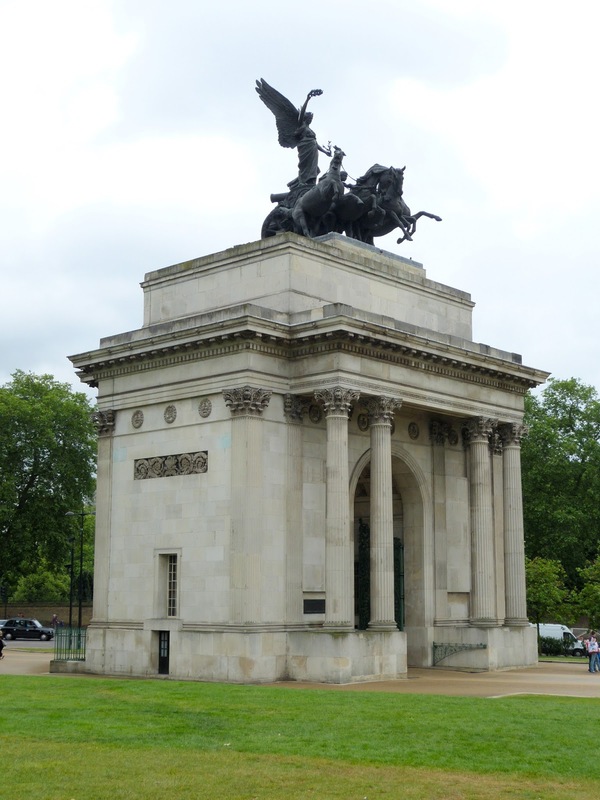 Various monuments were erected in his honour including the Wellington Arch, Hyde Park Corner, London. In 1814, the House of Commons granted Wellington £400,000 to buy an estate to support his new rank and in November 1817, Stratfield Saye near Basingstoke in Hampshire was purchased for the Duke. 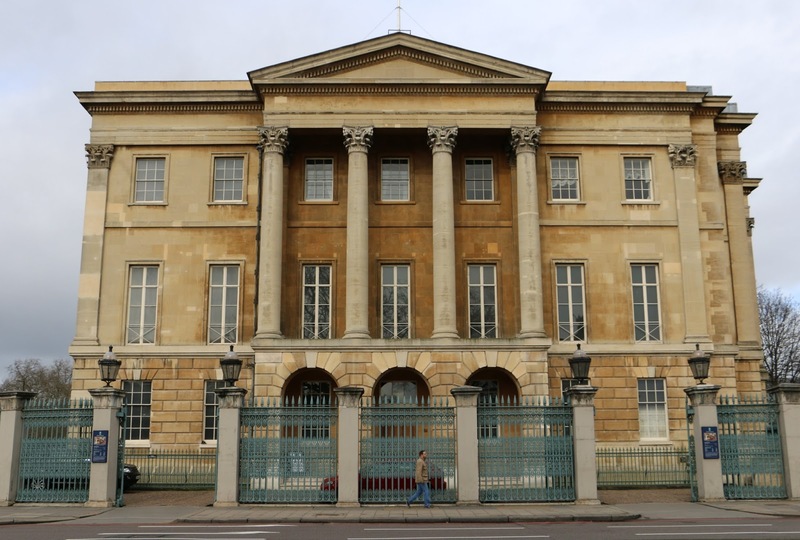 In the same year, Wellington bought Apsley House from his brother Richard at a generous price. He later employed the architect Benjamin Wyatt to remodel it to house all the trophies and other gifts that had been showered upon him. Before Wellington went to India, he was MP for Trim in the Irish parliament (1790-7) through his family’s influence. After his return, he became a British MP in order to be able to defend his brother Richard who stood accused of maladministration and fraud during his time in India. 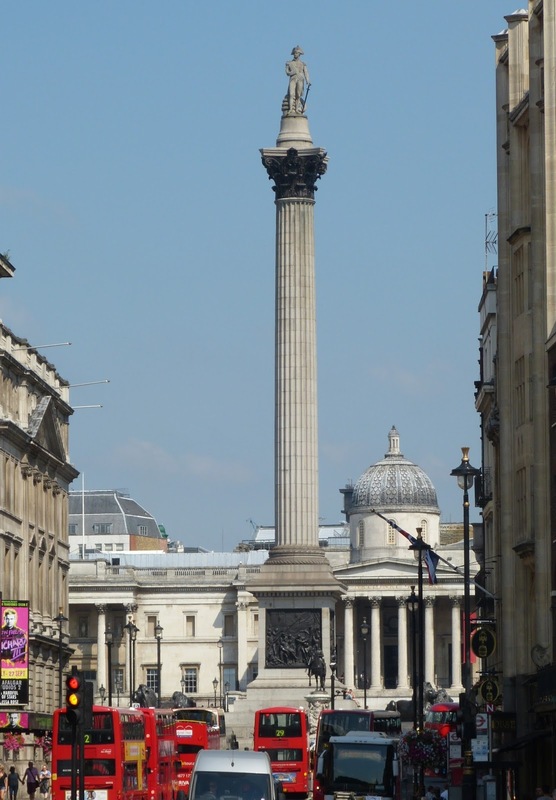 It was when lobbying the government in this cause that Wellington had his one and only meeting with Admiral Horatio Lord Nelson. Wellington was MP successively for Rye (1806), Mitchell (1807) and Newport on the Isle of Wight (1807-09), during which time he was Chief Secretary for Ireland. 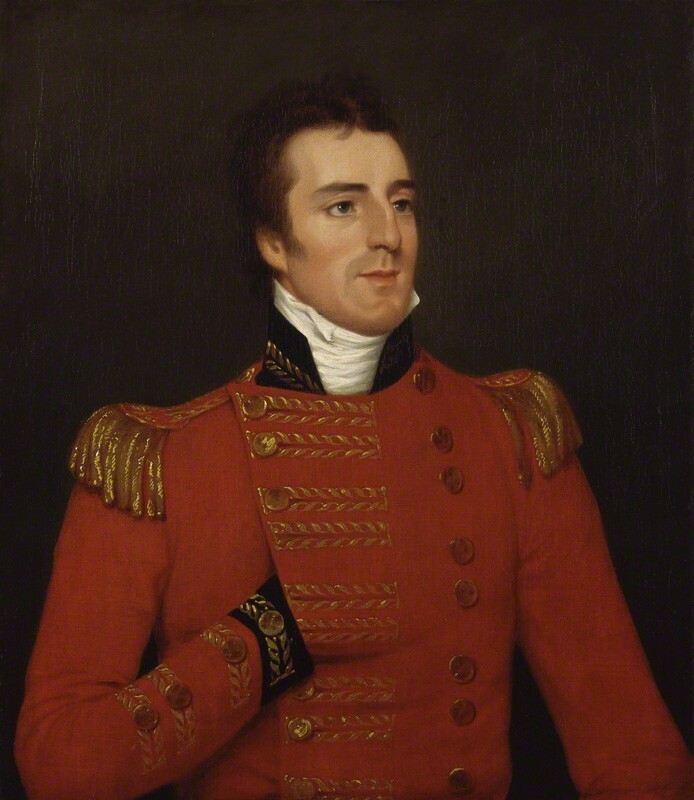 When he returned to England in 1817, Wellington was made Master General of the Ordnance—the only cabinet office of a military character. 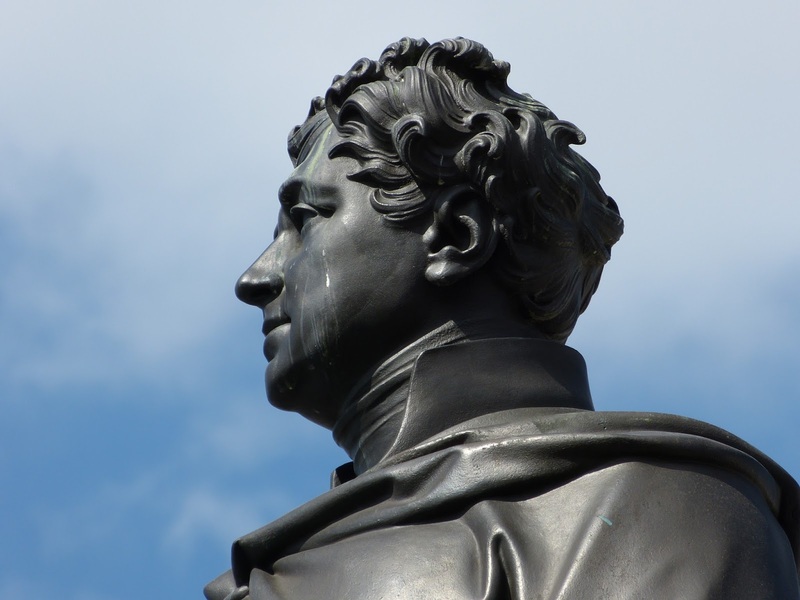 But when Canning became Prime Minister in 1827, Wellington refused to serve under him and resigned. 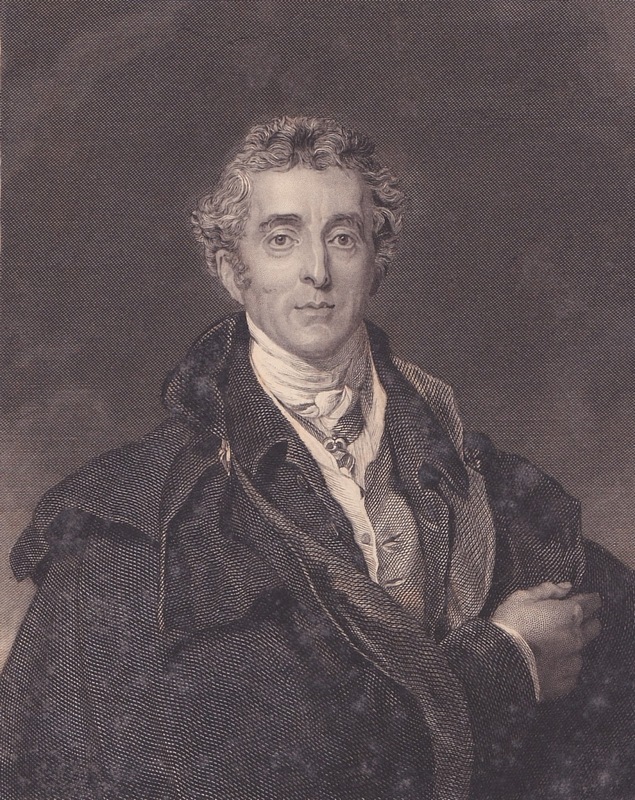 When Canning died just a few months later, Viscount Goderich replaced him, but his government did not last much longer and in 1828, Wellington was made Prime Minister. Wellington opposed reform but yielded on the matter of Catholic emancipation in order to secure stability. 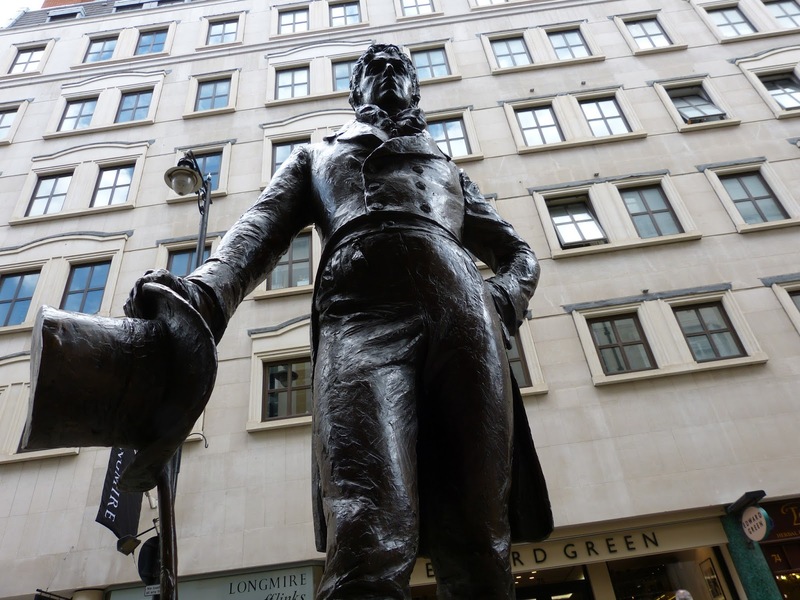 However, in so doing, he alienated some of his more extreme supporters and in the face of widespread support for parliamentary reform, Wellington resigned in November 1830. 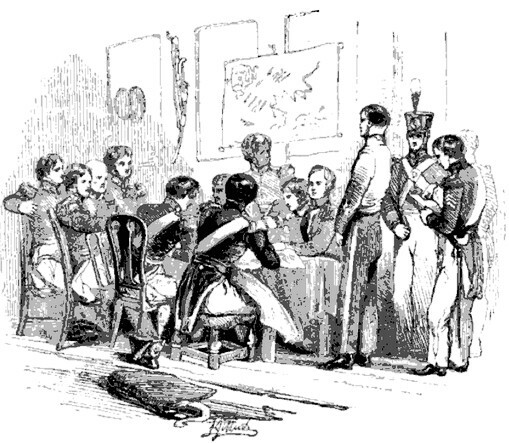 Despite Wellington’s opposition, Lord Grey’s government passed the Reform Act in 1832. 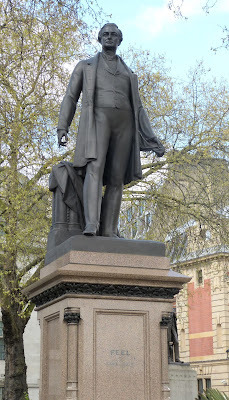 Wellington was again Prime Minister for a few months in 1834 before stepping aside for Sir Robert Peel and taking on the role of Foreign Secretary instead. Wellington’s speech in favour of Catholic emancipation particularly outraged the Earl of Winchelsea who accused the Duke of introducing Popery into the government. The Duke challenged Winchelsea to a duel which took place on Battersea fields on 21 March 1829. Winchelsea did not fire; the Duke missed, but whether he deloped on purpose or missed because he was a bad shot, nobody really knows. Winchelsea apologised and the matter was closed. Wellington was also appointed to other roles including Lord Lieutenant of Hampshire (1820), Constable of the Tower and Lord Lieutenant of the Tower Hamlets (1826), Commander-in-Chief of the Forces (1827-8 and 1842-52), Constable of Dover Castle and Lord Warden of the Cinque Ports (1829) and Chancellor of Oxford University (1834). 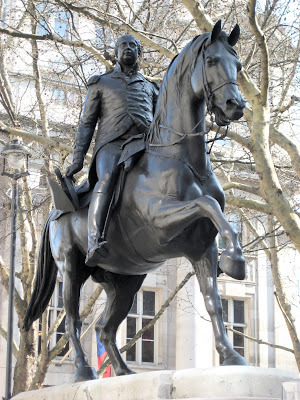 The story of Wellington’s marriage is very sad. In 1793, the young Wellington proposed to Lady Catherine Pakenham but his offer was refused by her family because of his lack of prospects. In a dramatic gesture, he burnt his violin and devoted himself to his military career. 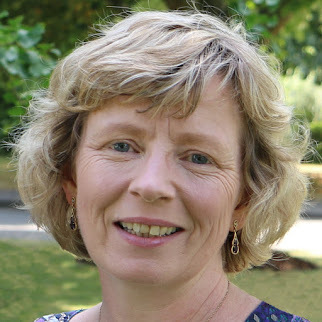 Whilst serving in India, Wellington did not communicate at all with his erstwhile love, although they heard of each other through a mutual friend, Lady Olivia Sparrow. 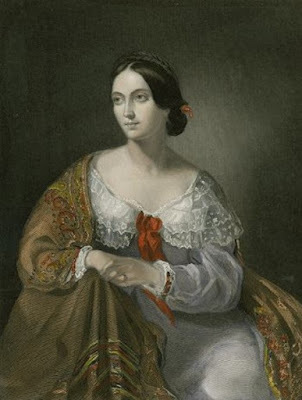 Lady Catherine, known as Kitty, clearly thought the relationship was over as she had become engaged to someone else, although she had later broken it off. 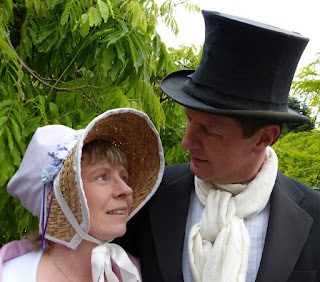 However, Lady Olivia persuaded Wellington that it was his duty to marry Kitty. Without even seeing her, Wellington proposed to Kitty by letter in November 1805 and was accepted. They were married in Dublin on 10 April 1806 and had two sons Arthur (1807) and Charles (1808), but it was a most unhappy marriage. Kitty was no longer the lively girl that Wellington had fallen in love with. He wanted a socially able hostess, but Kitty proved to be insecure and tactless and his behaviour towards her was not kind. It was not until Kitty was dying in 1831 that Wellington finally softened towards her. Wellington had relationships with numerous women including the famous courtesan Harriette Wilson. He may have had an affair with Lady Charlotte Greville, but rumours of an affair with Lady Frances Webster were groundless (3). He also had many platonic friendships with women. 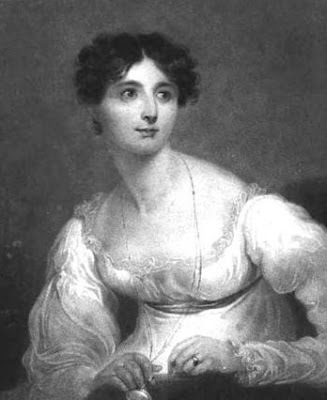 He enjoyed the company of Lady Shelley, the young marchioness of Salisbury and his elder son’s wife, Lady Douro, and most especially, Mrs Arbuthnot. It was rumoured that Harriet Arbuthnot was his mistress, but this was not so and her husband went to live with the Duke after her death. Other friendships were fuelled by letter writing. 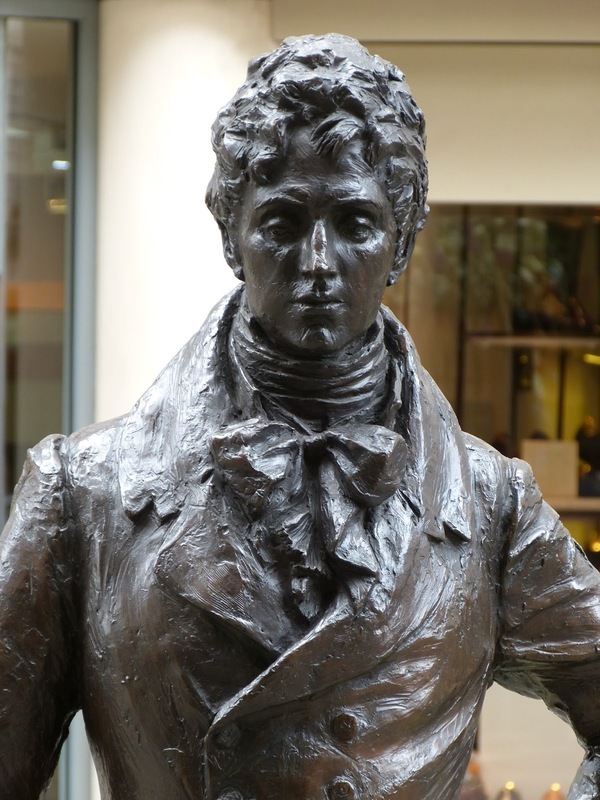 He sent nearly 400 letters to Miss Jenkins between 1834 and 1851 and over 800 letters to Angela Burdett-Coutts. Wellington was called the Beau by his officers and later the Peer, but by his less respectful troops, he was referred to as Atty (for Arthur) or Nosey (making reference to his prominent aristocratic nose). 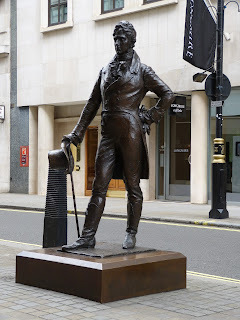 But perhaps the most famous epithet applied to Wellington is that of the Iron Duke. The name is said to originate, not from his unemotional public demeanour, but from the iron shutters that he installed at Apsley House after pro-reform rioters broke his windows in 1831. In November 1839, Wellington suffered a stroke whilst at Walmer Castle. More strokes followed with the final one proving fatal. He died on 14 September 1852 at Walmer Castle and after his body had lain in state, it was transported to London by train. On 18 November 1852, Wellington was given a state funeral at St Paul’s Cathedral. The procession followed a route from Horse Guards to St Paul’s via Constitution Hill and was said to have been witnessed by one and a half million people. 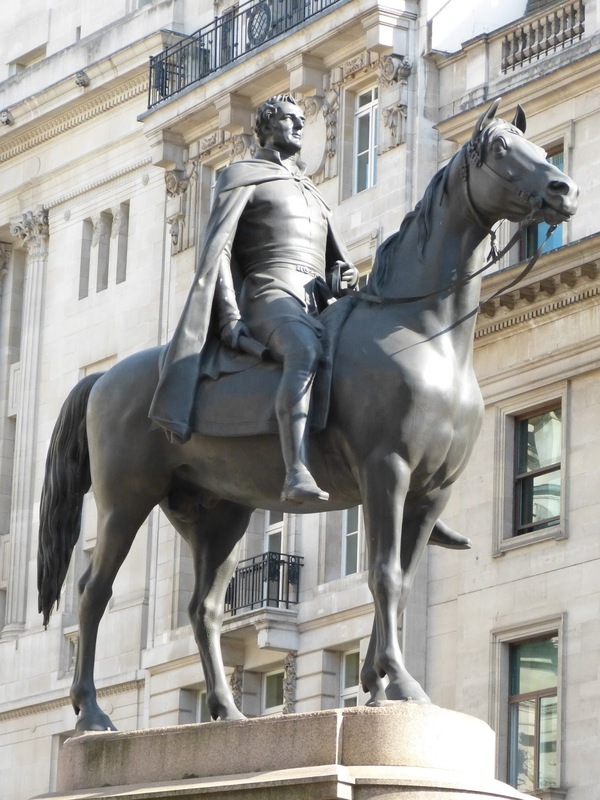 (1) There appears to be some doubt as to the exact date of Wellington’s birth. A christening record for the 30 April suggests that he may have been born on the 29 April, but his parents both confirmed the date of 1 May and this was the date that Wellington himself celebrated as his birthday. (2) This picture is © National Portrait Gallery and is displayed under a Creative Commons licence. (3) From Gash's entry in Oxford Dictionary of National Biography (see source below). 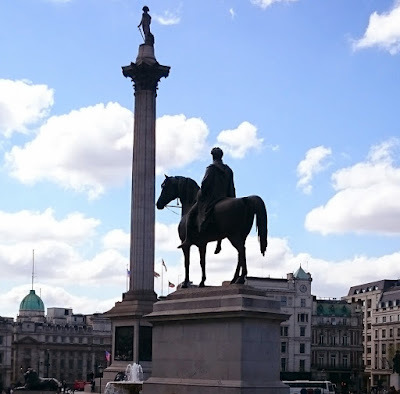 Although I live down by the sea in sunny Weymouth in Dorset, I am fortunate to have the opportunity to visit London on a regular basis as my parents live a short train journey away from the capital. Walking through the streets of London, I always try to spot things with a Georgian connection and my husband, Andrew, obligingly takes lots of photos for me. This post takes a look at some of the statues in London that commemorate Georgian royalty and other prominent figures. It is by no means an exhaustive list and no doubt I will discover more in the future. Let us start with royalty. 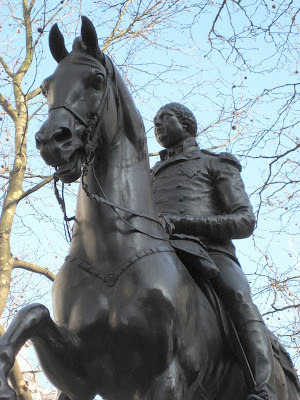 There are impressive equestrian statues in London of both George III (1738-1820) and George IV (1762-1830) situated within a short distance of each other. George III, by the sculptor Matthew Cotes Wyatt, is on Cockspur Street—a two minute walk away from Sir Francis Legatt Chantrey’s statue in Trafalgar Square, where George IV sits astride his horse in front of the National Gallery. At the top of his column in Trafalgar Square is the famous naval hero of the Battle of Trafalgar, Admiral Horatio Lord Nelson (1758-1805). 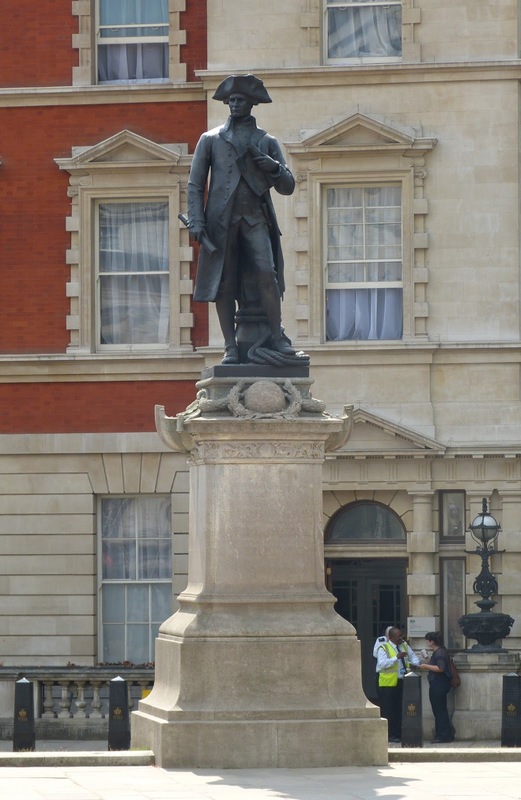 But perhaps lesser known is the Duke of York column, just off The Mall, supporting a statue of Frederick, Duke of York (1763-1827), George III’s second son, who was Commander in Chief of the British Army 1795-1809 and 1811-1827. Appropriately, there is a statue of Sir Joshua Reynolds (1723-1792), the first President of the Royal Academy, in the courtyard of Burlington House on Piccadilly, home to the Royal Academy since 1874. 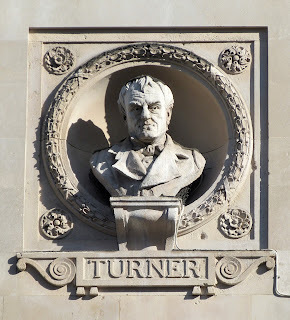 On the outside of the Royal Society of Painters in Watercolours on Piccadilly, you can see the busts of famous artists including JMW Turner (1775-1851) and Paul Sandby (1731-1809), one of the founder members of the Royal Academy. 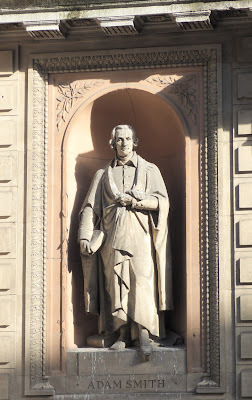 In 1956, a bust of the architect John Nash (1752-1835) was erected outside All Souls Langham Place—a church that he had designed. 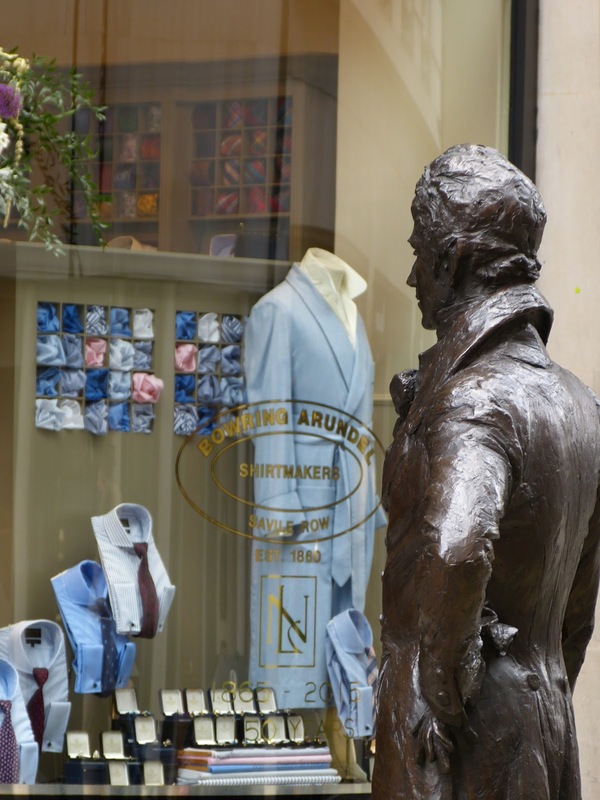 The statue of Beau Brummell (1778-1840) on Jermyn Street is relatively new—it was only erected in 2002. 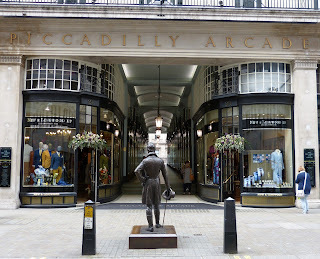 It seems a fitting site for Beau—looking down the Piccadilly Arcade with its superior shops selling everything for the gentleman of fashion, from made-to-measure suits and footwear to jewellery and grooming products. 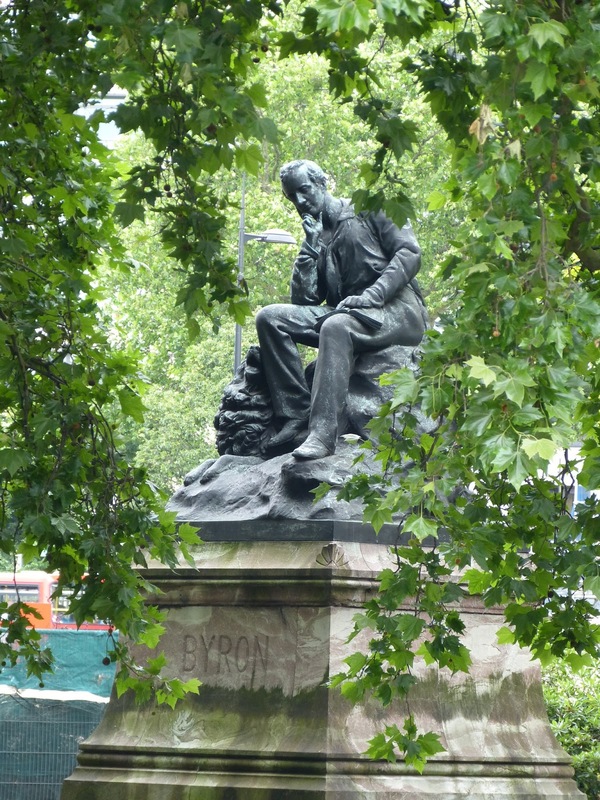 The famous Romantic poet, Lord Byron (1788-1824), is commemorated by a somewhat isolated statue in a very unromantic position on a traffic island on the hugely busy Park Lane. Adam Smith (1723-1790) was a Scottish economist and philosopher. 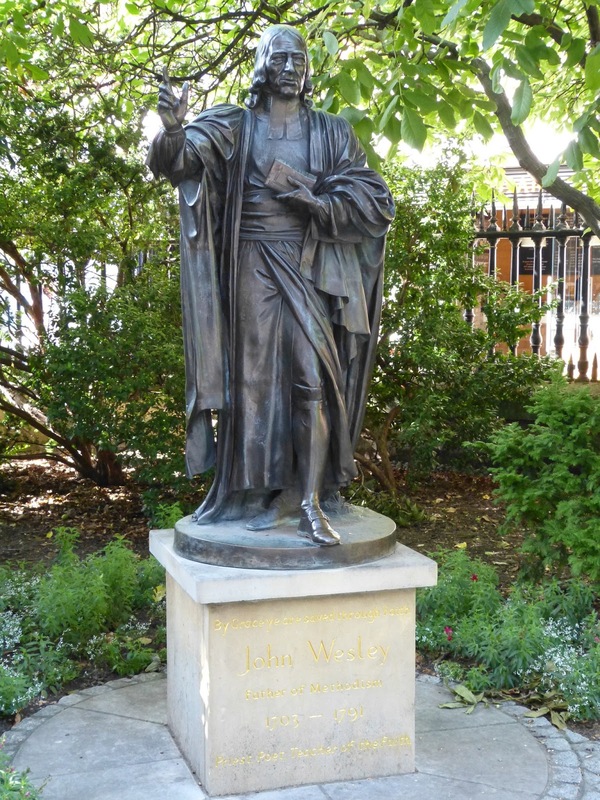 He wrote The Wealth of Nations in 1776—it was still on the reading list when I studied economics at university! 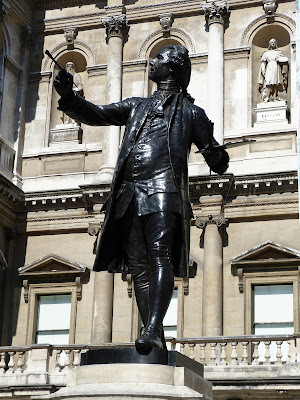 You can find his statue on the rear of Burlington House. Captain James Cook (1728-1779) was a naval captain, explorer and cartographer. His statue was erected on The Mall in 1914. An equestrian statue of Arthur Wellesley, 1st Duke of Wellington (1769-1852), military hero of the Battle of Waterloo and British Prime Minister stands on Threadneedle Street, outside the Bank of England. 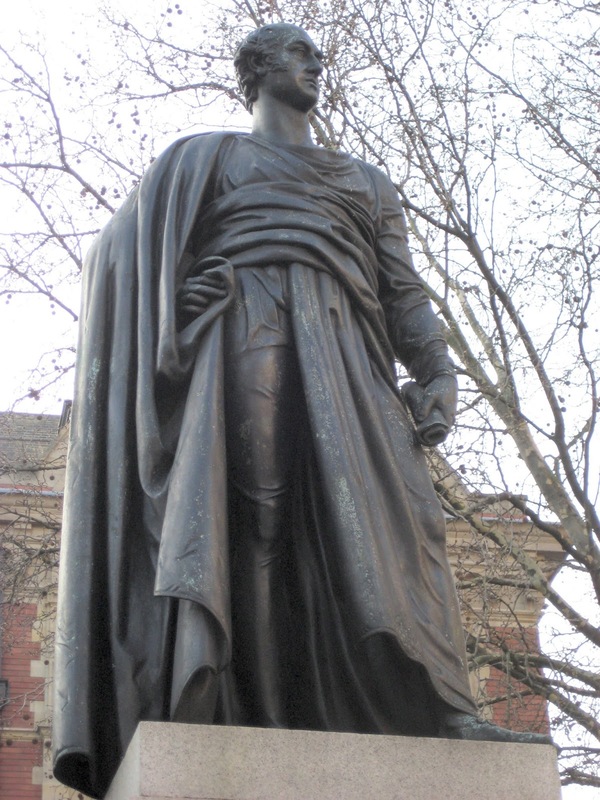 Another Georgian Prime Minister, George Canning (1770-1827), stands in Parliament Square along with several of his successors, including Sir Robert Peel (1788-1850). 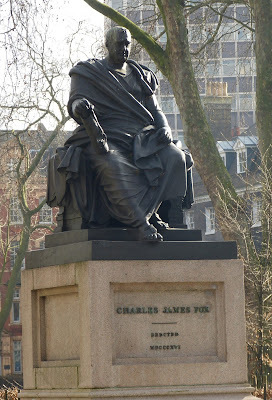 A statue of the Whig politician Charles James Fox (1749-1806) stands in Bloomsbury Square Gardens. He holds a copy of the Magna Carta in his hand, signifying his role as the 'Man of the People'. Thomas Coram (1668-1751) set up the Foundling Hospital in 1741. 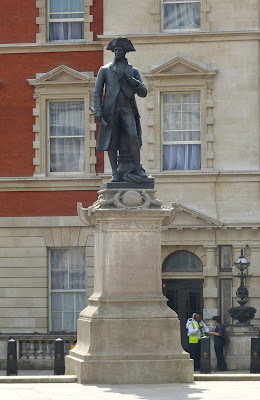 His statue is outside the Foundling Museum on Brunswick Square, London. John Wesley (1703-1791) was an evangelical Anglican minister who, together with his brother Charles and George Whitefield, founded the Methodist movement. His statue stands in the gardens of St Paul’s Cathedral. All photographs © Andrew Knowles - see more of Andrew's photos of London on Flickr.